C. Blohm & Associates, Inc. (CB&A), the premier public relations firm for the education industry, was proud to receive four honors at the PRSA-Madison Alchemy Awards ceremony Oct. 18. 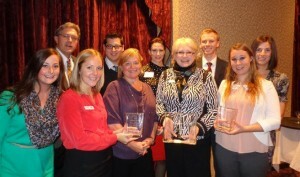 The CB&A team is joined by Barb Hernandez (middle, front row) at the PRSA-Madison Alchemy Awards. Hernandez coached the team on creating successful award entries. Honored by three Awards of Excellence for a trio of campaigns completed in the past year, the CB&A team was thrilled by a Best in Show award for our Media Central campaign hosted at the International Society for Technology in Education 2012 Conference. CB&A shared the evening’s top campaign award with St. Mary’s Hospital, which was honored for its work celebrating the organization’s centennial. Originally scheduled 56 meetings – 8 per client – with top-tier editors, but greatly exceeded that goal, hosting a total of 139 meetings. Facilitated meetings with 11 prospective clients, nine more than planned. Hosted virtual meetings over Skype for clients with media who couldn’t attend. Created a dedicated ISTE page on the CB&A website featuring info on Media Central, virtual media kits, news announcements and San Diego travel tips. 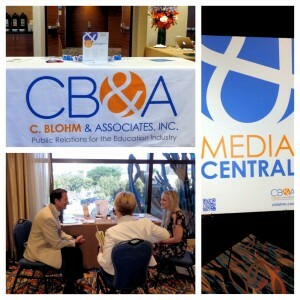 A collage of photos taken at CB&A’s Media Central at ISTE 2012. As part of a larger effort to raise the company’s visibility and enhance SEO results, CB&A lead the creation of an infographic. The infographic was built around stats relating to the mobile studying habits of students. To provide a better destination for media, industry influencers, clients, employees and prospects, CB&A sought to revamp its entire website. Also, we’d like to thank Winter Group for all of its support in helping us create our beautiful online presence. Having been nominated for three awards and coming home with four honors was an extremely humbling and rewarding experience for the CB&A team. The awards are a culmination of many hours of hard work by everyone at CB&A. From planning the many facets of hosting Media Central, to developing the infographic, to maintaining our beautiful website, and even for the time and effort it required to create the successful award entries – all of the projects were extremely challenging, but very rewarding in the end. Thanks to the folks at PRSA-Madison for hosting a wonderful event, and a “Congratulations” to all the other Alchemy Award winners. For a full recap of the evening’s awards, please read the official PRSA-Madison news release. Three Years in a Row! And a Double Winner at That!